Food fortification is a process of adding one or more micronutrients to a food product. It is done either for commercial purposes (to enhance the nutritional quality of the product) or under a food policy to reduce the occurrence of dietary deficiency on a mass scale. It is also done for the foods which are meant for special dietary purposes such as formulated liquid diets, nutritional supplements, meal replacements, low sodium foods, gluten free foods and sugar free foods. 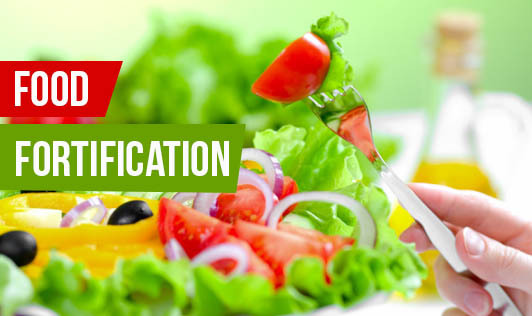 Food fortification is of different types such as mass fortification, targeted fortification, market driven fortification, household and community level fortification. Nutrients such as iodine, calcium, fluoride, vitamin D, vitamin A, B complex vitamins, omega 3 fatty acid are mainly used for fortification. It helps to reduce the nutritional deficiencies, and so improves the health status of the population at large. Many deficiency diseases can be prevented through fortification. Regional diets can be deficient in certain micronutrients. Food fortification helps to bridge this gap and prevent nutritional deficiencies. Fortifying foods is a boon for mankind.